This product is the optimized version of a protective apparel to be used in kitchens while handling with extreme temperature objects. It is a two in one apparel: apron plus gloves, ergonomically designed for the domestic and industrial kitchens. The apron includes protective gloves which are easily and always accessible to the user. The introduction of an effective adhesion handsobjects solution, the development of a gloves-apron integrated system and the introduction of structures to help transport the objects during the handling process are the reasons for the superior performance of the present invention. The apron contains protection and ensures that user’s vests are kept clean. 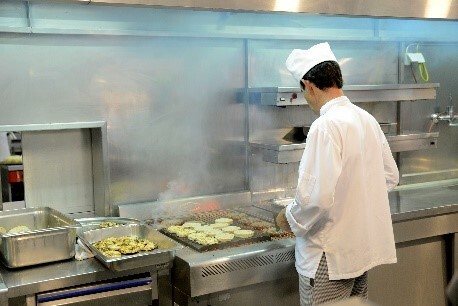 One of the greatest problems encountered in kitchens is the reduced use of personal protection apparel. In most cases, commercially available apparel is not able to fully protect the user against burn injuries. In addition, personal protection apparel is seen as being uncomfortable, non-ergonomic and not appealing. Hence, there is a demand for new personal protection solutions, which satisfy users’ comfort while assuring their effective protection and enjoyment. This low-cost apparel presents an unprecedented combination of features which allows an effective, safe and easy handling of extreme temperature objects. The refined, ergonomic and lightweight design of the apparel also favors its use. This product aims the food sector and can be used both in domestic and industrial kitchens, as a personal protection while handling extreme temperature objects (e.g. oven tray). A totally functional prototype has already been developed and tests have been made.